In Handbook for Multisensory Worship, Volume 2, Kim Miller and the worship team of Ginghamsburg Church—widely known for their innovative use of multimedia elements in worship—provide more practical guidance for planning and conducting dynamic worship celebrations. Through the skillful blending of contemporary media such as music, film, and drama with the timeless truths and stories of the Bible, these celebrations help postmodern persons—particularly those who have little or no experience with the Christian faith—experience God’s love and become faithful followers. 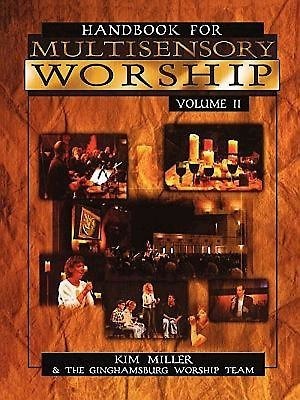 Included in this second volume are 30 new and complete worship celebrations, each organized around a central metaphor and theme designed to articulate the needs of and connect with the life experiences of the congregation. The components of each celebration—suggestions for dramatic visuals, lively music, enlightening dramas, and inspiring prayers—all combine to powerfully embody themes for the worship celebration. For example, in the celebration “Navigating Rough Water,” the image of whitewater rafting illustrates the turbulent events that occur in all our lives, and the celebration focuses on God’s sustaining presence during these difficult times. “Real Followers” uses the juxtaposed images of a cross and a ladder to represent the competing claims of radical discipleship with worldly ambition and success. Kim Miller is Creative Director of Worship at Ginghamsburg Church where she and the worship team work to create an atmosphere where people can experience God. Kim draws on her background in theatre and visual arts to powerfully and creatively combine drama, graphics, music, and storytelling with preaching. Each week Kim and the worship team of Mike Slaughter (Senior Pastor), Todd Carter (Media Director), and Francis Wyatt (Music Director) plan and coordinate the four worship services for the growing Ginghamsburg community.